The Three Sisters Wilderness is the second largest wilderness area in Oregon, and one of the most popular. * The North, Middle, and South Sisters give the wilderness area its name, but the area also includes Broken Top and several incredible alpine lakes (beware of mosquitos in June and July). Approximately 240 miles of trails provide ample opportunity for hiking, camping, backpacking and mountaineering. Throughout the wilderness you'll see stunning examples of the volcanic and glacial activity that has shaped the ridges, water flows, lakes and alpine meadows of the Central Oregon Cascades. Hikers in the summer are likely to see colorful and diverse flora, not to mention geological wonders such as obsidian. This shiny, black volcanic glass was formed by rapidly cooling lava, and its presence in the eastern regions of the country suggests that early native traders capitalized on its value. Today visitors can explore the Obsidian Area with a permit from the McKenzie or Sisters Ranger Stations. The North Pacific Crest Trail (PCT) Region is known for its extensive lava flows, flora and views of the North Sister. It is best accessed off of the Old McKenzie Highway. ** Popular adventures include: Proxy Falls, the Obsidian Trail, Matthieu Lakes and Black Crater. 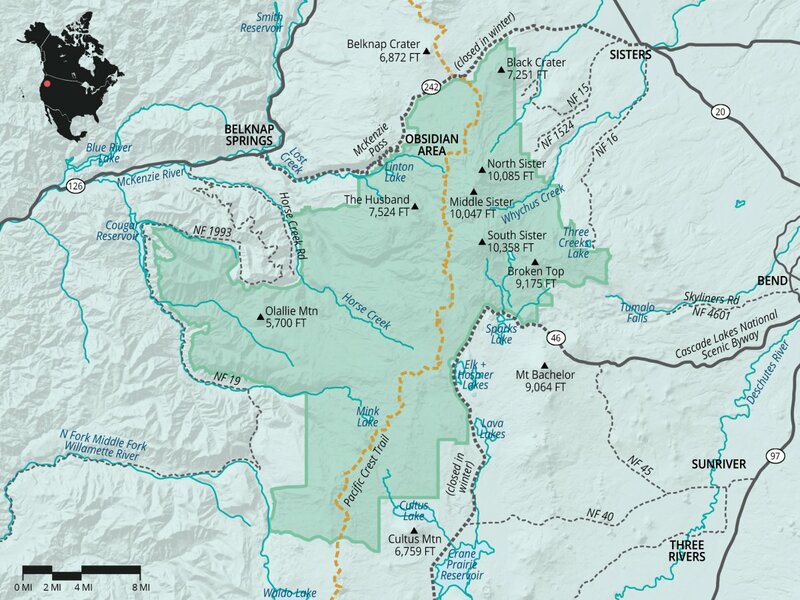 The Central PCT Region is known for its alpine meadows, lakes and the trails up the Middle and South Sisters. It is best accessed from the town of Sisters via Three Creek Lakes Recreation Area. Popular adventures include: Tam McArthur Rim, Three Creek Lakes, Park Meadow, Demaris Lake and Chambers Lakes. The Southern PCT Region is known for its dense forests, lakes and high concentrations of mosquitoes. It is best accessed from Bend via the Cascade Lakes Scenic Byway. ** Popular adventures include: Sisters Mirror Lake, Horse Lake and the Mink Lake Area. The French Pete Creek and Western Region is known for its old-growth forests, mountains and lighter crowds. It is best accessed through Cougar Reservoir via Highway 126. The Broken Top and Green Lakes Region is more heavily visited by climbers, campers and backpackers than other areas. This region is best accessed from Bend via the Cascade Lakes Scenic Byway. ** Trailheads are at Todd Lake, Fall Creek and Devils Lake. Popular adventures include: the South Sister and Broken Top, Green Lakes, Moraine Lake and Broken Top Crater. * The Eagle Cap Wilderness is Oregon’s largest at 361,446 acres. ** The Old McKenzie Highway/Highway 242 and the Cascade Lakes Scenic Byway are only open during the summer months, typically from late June to early November. Visit ODOT for highway updates. Three volcanos over 10,000 feet. 260 miles of trails. 40 miles of the Pacific Crest Trail. Mosquitos in the southern lakes area. Heavy use in the Green Lakes area.